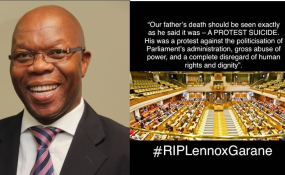 The family of Lennox Garane, the parliamentary manager who committed suicide last year as a protest against abuse and bullying within parliament's administration by senior staff, has declared itself "greatly disappointed that Parliament did not keep to any of their promises with regards to the investigation" into his death. With little advance notice and no public consultation Parliament appointed the Public Service Commission (PSC) to conduct an inquiry into the tragedy. However, in a letter to the PSC dated 19 December the Garane family wrote that parliament "has dealt with the family in a "dictatorial manner as opposed to a collaborative relationship promised" and adds that this "has only further increased our distrust for the parliamentary system in its commitment to administrative justice." The Garane family is full of praise for the way the PSC has conducted itself, and in its latest correspondence with the PSC expresses thanks for "the consummate and empathetic manner in which it dealt with the family". However, it described parliament's response as "arrogant", "disappointing" and "inadequate". Of greatest concern is the decision that the PSC will report to the Executive Authority (EA) of parliament, namely Presiding Officers Speaker of the National Assembly Baleka Mbete and the Chairperson of the National Council of Provinces Thandi Modise. The family hold these very leaders complicit in their father and husband's decision to shoot himself in his parliamentary office after enduring what he described as months of management bullying which had been brought to the attention of the EA as well as the human resources department, to no effect. The Garane family asks if there is not a conflict of interest in the PSC reporting to the very same people that that believe should be "subjects of the investigation". The family noted their "serious misgivings about the commission reporting to the Presiding Officers, whom we believe to be answerable in this investigation as well". Instead they proposed that the PSC have dual reporting lines ‑ to the EA and the Joint Standing Committee in Financial Management (JSCFM). "This, we thought, would have been a sound compromise for the integrity of the investigation to be upheld." However, this compromise solution "was summarily dismissed by Parliament, through [Secretary to the National Assembly, Masibulele] Xaso, who responded on behalf of the Presiding Officers," the family has confirmed. In his reply to them, Xaso wrote "we note your objection to the PSC reporting to the Executive Authority and wish to confirm that the Executive Authority will determine the appropriate process to deal with the PSC report, having due regard to 'fairness and neutrality' and will in all probability share the report with the JSCFM"
The family finds unacceptable the notion that the EA will "share the report with the committee if they see fit." They also point out this means that they may never get to see the report and they demand that it is delivered to them directly by the PSC, instead of "waiting for the Presiding Officers to share it with us". In the eyes of the Garane family, parliament's response was "inadequate" and no more than "a lethargic attempt to leave room for potential maneuver". They realised that "the correct institution to direct those questions would be the PSC itself rather than parliament". A second letter, this one directed to the PSC, includes: "We remain greatly disappointed that parliament did not keep to any of their promises with regards to the investigation. The institution has dealt with the family in a dictatorial manner as opposed to a collaborative relationship promised. We remain hopeful, though, that the PSC will do justice to this process by steadfastly sticking to its constitutional mandate." The family also asked if the PSC has jurisdiction over parliament and is indeed the correct body to conduct the inquiry, in terms of s195 of the Constitution of the Republic of South Africa, the Public Service Act (1996) and Public Service Commission Act (1997). They also forwarded this question to the PSC itself, and it is now under consideration. The PSC is expected to reply in mid-January. Another matter of clarification included in the family's letter that was sent directly to the Chairperson of Public Service Commission and the PSC Investigating Officer concerns the scope of the inquiry. The family wrote that in their initial conversation, the presiding officers had promised to engage the family on the terms of reference and allow it an opportunity to contribute to the final terms of reference (TORs). The family is of the view that the ToR scope is too narrow and "scantly" covers the broader institutional failures that Lenox Garane had discussed with family members. In light of their understanding of what he had experienced the family requested Parliament to expand the ToR from "... investigation into personnel practices pertaining to Mr Lennox Garane... " to "... investigation into organisational, administrative and personnel practices... ". They say this request "was turned down without a satisfactory reason". In the letter to the PSC, the family writes: "The main reason for the family to prefer the scope to be expanded is due to our belief that the deceased did not lay down his life due to his individual circumstances but in protest against [the] wider organizational culture that enables perpetration of these acts. "In our correspondence with Parliament, in this regard, we ventilated our wish for the commission to rather table its report with the Joint Standing Committee in Financial Management (or a similar structure). This is because we wanted justice to be seen to be done. This was also arrogantly turned down by the presiding officers, acting through Mr Xaso. We were informed that the Executive Authority will share the report with the committee if they see fit. This is highly unacceptable and has further raised our distrust of the Executive Authority of Parliament. "It is now public knowledge that what was meted [out] against Lennox was not an isolated incident. He knew that those who were directly practicing callous acts towards him, and many others, were only doing so because there was grand scale bullying and victimization at an institutional level. We urged Parliament or the Executive Authority to be honest about fixing the malpractices and institute an institutional investigation rather than an incidental one." This suggestion, too, was politely turned down by Parliament, they family report, saying they were told that "this was meant to address the matter of Mr Garane" and "should the PSC report indicate a need for a broader investigation, that will be considered". "We do not think the two are mutually exclusive, in fact they are inextricably linked and need to be understood as such. It is our belief that individualisation of institutional or societal issues will only lead to misdiagnosis of the problem and thus not yield the intended results." In their appeal to the PSC they state that from the legal advice they have received it is their understanding that s196 (4) (f) does allow the PSC to expand the scope of its investigations if it choses to do so. "We are of the view that Lennox Garane's ordeal [is] likely [to be] repeated if this is not addressed at an organizational level," the letter states. Also of concern to the family is that the PSC has stated that it views its recommendations as "advisory", yet according to the PSC rules, if the EA decides not to implement its recommendations they must provide the Commission with reasons for not doing so within 10 days. The Garane family believes this implies that the commission's findings and recommendations are binding, unless the Commission is presented with acceptable reasons for not complying. Lastly, the family calls for anyone named in the final report as responsible for the suicide to be suspended pending further investigations. On receipt of the PSC report the family intends reporting all accused political appointees to their respective party disciplinary committees and will recommend their expulsion for bringing their party into disrepute. Meanwhile, it is now known that the PSC extended an invitation to aggrieved staff to make submissions, although this message reached very few of the many who have left parliament in the last year or so in protest or because they found it intolerable. Two are known to have testified, and they confirmed that there is a move by former managers to collectively solicit civil society support for the matter because they believe it to be in the public interest. Martina Della Togna, former manager of the multi-media department who has also taken her case to the Public Protector, confirmed that she testified to the PSC "on abuse of power, labour malpractice and the toxic environment in the Parliament Administration. "As former managers we each have direct experience of the toxic workplace environment in the Parliament administration during the 5th Democratic Parliament: it is this toxicity that caused us to leave the administration; it is this toxic environment that led to the tragic, unprecedented death by protest suicide of Mr Lennox Garane," Della Togna said. Dr Tania Ajam, former Chief Researcher at Parliament, who also resigned after getting ill from the stress she experienced in the job said, "the key public interest issue is around the non-performance of parliament and whether the same level of dysfunctionality will be bequeathed to the 6th parliament. "Parliament allowed the repurposing of state institutions to serve elites during the state capture era. It cannot happen again. State capture diverted scarce public resources away from education, health, community policing and housing. Future proofing this country against capture needs parliament to exercise independent and effective oversight. To do this, a well functioning, professional administration is indispensable. "We all need to pick our battles judiciously," Dr Ajam said. "I believe this is one worth fighting." Efforts to get comment from parliament received no response.